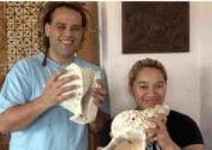 Wai (means "water" in Maori) is New Zealand Maori band formed in 1999. Band is led by producer/singer/songwriter Mina Ripia and producer/musician Maaka McGregor who together blend vocals, rhythm and technology, joined by the new Wai live line up Gaynor Rikihana, Corrie Brooking and Desmond Mallon. Poi sounds, slapping, clapping, breathing, insects and birds combined with modern electronica, reggae, hip hop and drum 'n' bass create Wai sound.